"I... I... JUST WHAT AM I FIGHTING FOOOOOOOR!!" Many of the Mavericks may come across as Grade A Jerkasses, but, if you looked into the backstories of several of them, you'd find out that quite a few were actually innocent casualties that meant no harm, but were forced into their position by several circumstances (such as being forced into submission, infected by a virus, etc. ), such as Magna Centipede, who was kidnapped by Sigma and brainwashed into becoming maverick. What makes this a true Tear Jerker is that several, such as Storm Eagle and Shield Sheldon, seem to have resigned to their fates that their lives would end very soon, and they might as well give it their all before they literally Go Out With A Bang. Worse was the Manga adaptation of Storm Eagle: He was still a good guy. He was the Maverick Hunters' inside man, but he couldn't break cover until it was too late. 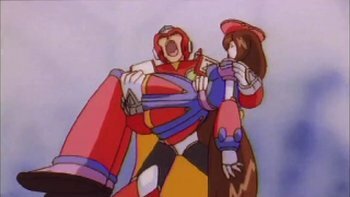 Iris' death in Mega Man X4. In particular, Zero's reaction to it, and his cold outlook on the world afterwards. It's easy to miss, but take a close look at Iris's face ◊ as she transforms. She's in pain. X's objective since the very first game is to fight for a world where humans and Reploids co-exist peacefully. Dr. Light even expresses this wish in his video to Dr. Cain in the ending of Maverick Hunter X. How does it all end? Peace is finally achieved when Zero sacrifices his life at the end of Mega Man Zero 4, but neither he nor X live to see that peace. In Zero's storyline of X4, the fight against Iris, and the result. Unfortunately, hammy 90s voice acting kind of ruined the moment a bit for American audiences, although the scene as originally done is far more effective at getting Zero's voice-ripping anguish across. "WHAT THE HELL ARE WE FIGHTING FOR?! ", indeed. The take done by Lucas Gilbertson (Zero's VA for MMX8, MMXCN, and HMX) of it is also a fitting example. And something of an awesome moment as he did it on his own free time. This take is perhaps much better than the original dub. This is even more tearjerking in hindsight after the untimely passing of Yuko Mizutani, Iris' Japanese VA.
Axl's scene about Red's death is no less of a tear jerker than that of Zero, perhaps even more so adding to the music accompanying in the background. Again, however, this only applies to the Japanese version; the English version is turned into Narm, as Axl sounds less "grief-stricken" and more "on the verge of throwing a childish temper tantrum". Here is a video of Axl's Japanese version of him screaming at a dying Red, starting at 5:00. Zero's final moments during his ending in X5. Utterly broken and defeated, he finally remembers what he was built for, apologizes to Iris's memory, and says that the world will finally be peaceful when he dies, right before he says goodbye to his best friend X. Given that Mega Man X5 was originally intended by Keiji Inafune as the final chapter of the X saga, it would have been Zero's final demise — until he is revived in Mega Man Zero. Then there's the alternate endings for both Mega Man X5 and Mega Man X6 where Zero isn't around at the end. Those endings imply that, with Zero neutralized, the world will finally be at peace, even though Sigma's alive at the end of Mega Man X6. It really hammers in how badly Zero's mere existence messed things up. X5's remix of Dr. Light's Mega Man X1 theme...even sadder than the SNES one. The unused track from X5 entitled "Armageddon" , for when the space colony crashed. It sounds like a rock ballad, but there's a sense of the Earth being wiped clean. The Alia and Gate track from Mega Man X6. It's a haunting piano melody that plays when Alia is talking about the Nightmares to X or Zero, but it sounds like what's played if somebody recently died. Even sadder when it's pitched down. The unused track for Zero's death in X5 is even sadder than the one they ended up using in some ways. The ending narration for the first game. Vile's death at the end of Maverick Hunter X in Vile mode. Shoot the Shaggy Dog doesn't even begin to cover it. The flashback of Dr. Light in Maverick Hunter X, as well as the recording. Seeing Dr. Light with an Incurable Cough of Death, telling X or whoever finds X his hopes and dreams, and lamenting how he won't live to see them. Zero's death after the fight with Vile in the first game. Made even more of a Tear Jerker in the remake with the voice acting and improved animation. In the original, Zero simply said his last words to X, who was kneeling next to him, and disintegrated without any dialogue from X. In the remake, Zero says his last words, clearly pained, while in X's arms. X's pleading for Zero to hang on doesn't help, especially when Zero finally goes limp and X quietly lays him down. Seeing Zero's remains laying there sparking is just the cherry on top. The ending to the remake added an extra punch to the gut. It has X getting ready to board a landchaser. He glances at the one next to his, only to remember that Zero's not joining him this time around. Because the sequels to Maverick Hunter X got cancelled, Zero is pretty much dead permanently in this continuity. Adding to it is the flashback of Dr. Cain finding X's capsule and we see a near-death Dr. Light explaining X's purpose.